This is an attractive - and/or fully matching! 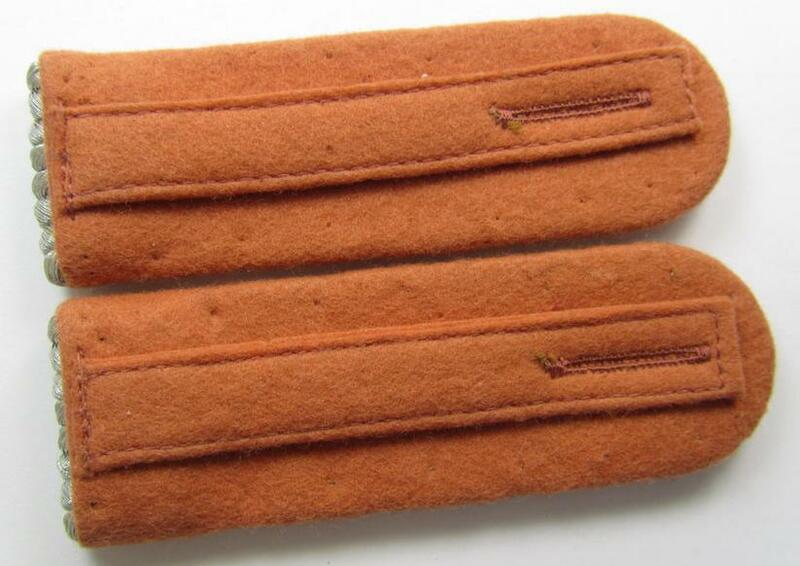 - pair of WH (Luftwaffe) officers'-type shoulderboards, as was piped in the neat copper-brown- (ie. 'kupferbrauner'-) coloured branchcolour, as was intended for a: 'Leutnant eines Nachrichten Regiments' (or: lieutnant who served within an airforce signals-unit- or regiment) and that comes in an overall very nice- (IMO never used- ie. 'virtually mint- ie. unissued'-), condition. The shoulderboards are 'text-book'-examples of the 'Luftwaffe'-type-, 'Nachrichten'-shoulderboards and have the bright-silver- (ie. somewhat 'shiny'-) 'upperdecks'. The boards show the copper-brown- (ie. 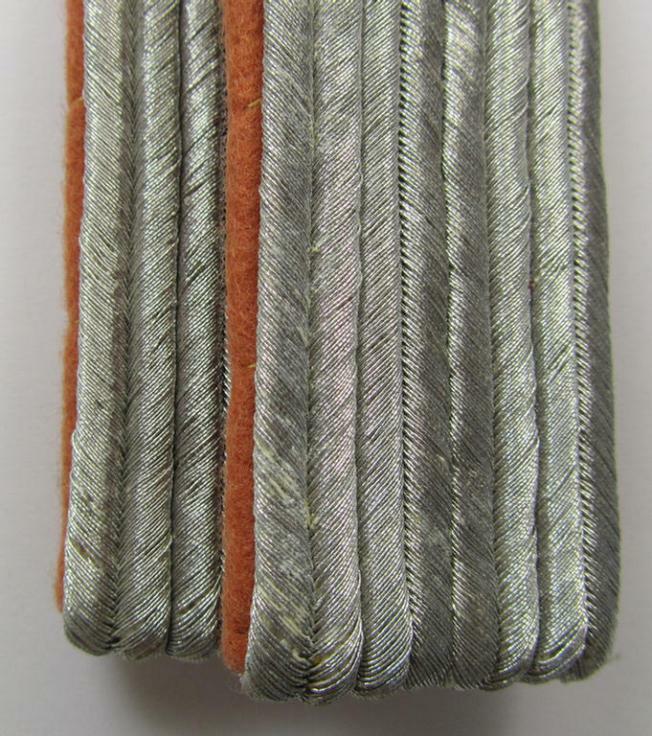 'kupferbrauner'-) coloured branchcolour (and were constructed from the 'smooth'-type wool as to be expected). The boards come mounted on their functional (smaller-sized-, greyish-coloured- and nicely 'woolen'-constructed!) tongues (as can be seen on the pictures). The boards measure approximately 10,5 cms. in length each as more often. The pair - which never had any cyphers nor pips attached - does show some minimal (storage) age and/or staining as to be expected. Simply an attractive shoulderboard-pair that belonged to a: 'Leutnant eines Nachrichten Regiments' and that is impossible to be upgraded! This is an attractive - and/or fully matching! 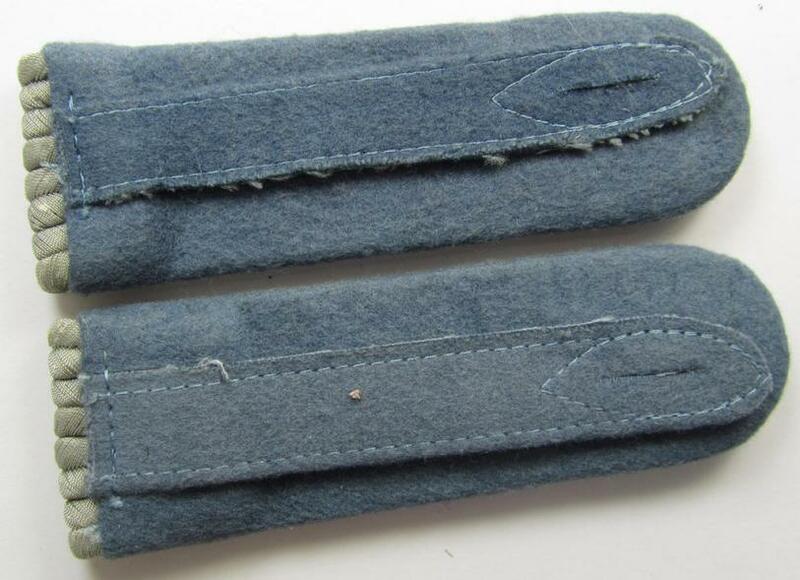 - pair of WH (Heeres) officers'-type shoulderboards, as was piped in the neat light-blue- (ie. 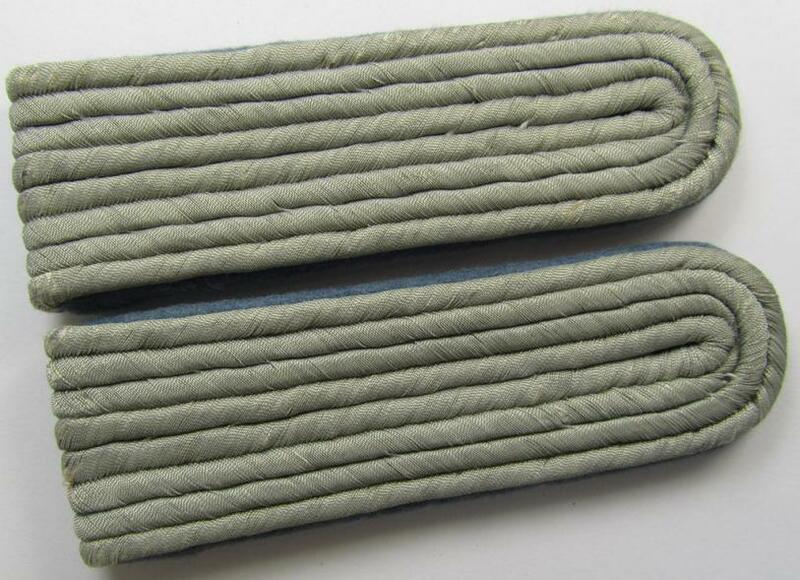 'kornblumenblauer'-) coloured branchcolour, as was intended for a: 'Leutnant eines Nachshub-Abteilungs' (or: lieutnant who served within an army transport-unit- or regiment) and that comes in an overall very nice- (IMO never used- ie. 'virtually mint- ie. unissued'-), condition. The shoulderboards are 'text-book'-examples of the 'Heeres'-type-, 'Nachshub'-shoulderboards and have the greyish-silver- (ie. somewhat 'sub-dued'-) 'upperdecks'. The boards show the light-blue- (ie. 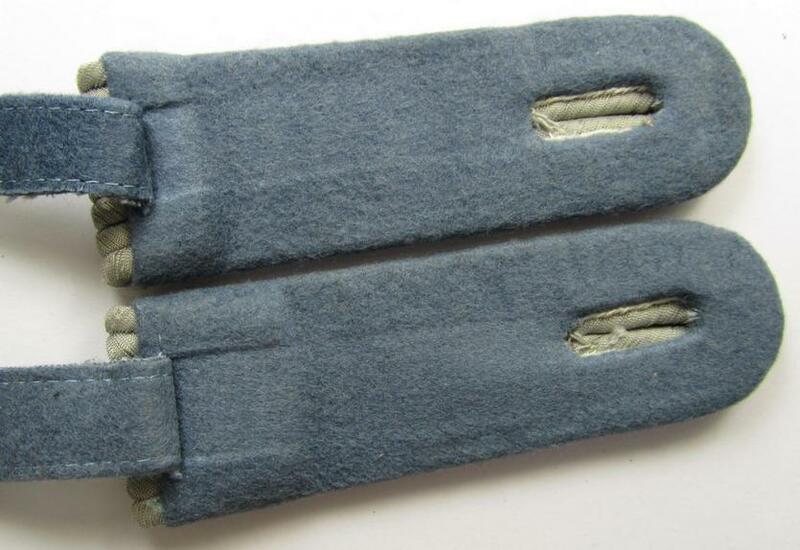 'kornblumenblauer'-) coloured branchcolour (and were constructed from the 'smooth'-type wool as to be expected). The boards come mounted on their functional (smaller-sized-, greyish-coloured- and nicely 'woolen'-constructed!) tongues (as can be seen on the pictures). The boards measure approximately 10,5 cms. in length each as more often. The pair - which never had any cyphers nor pips attached - does show some minimal (storage) age and/or staining as to be expected. Simply an attractive shoulderboard-pair that belonged to a: 'Leutnant eines Nachshub-Abteilungs' and that is impossible to be upgraded! This is a truly attractive - and truly very pronounced! 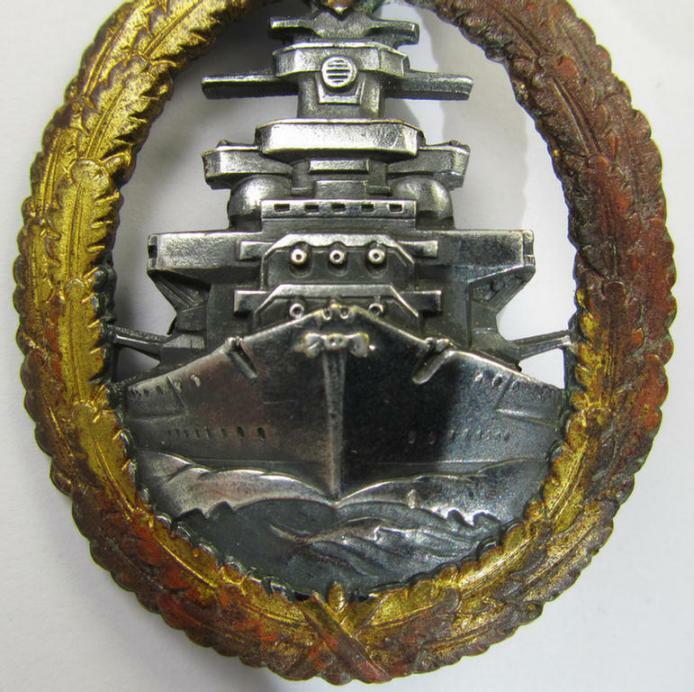 - example of a WH (Kriegsmarine) 'Flottenkriegsabzeichen' (or: high-sea fleet badge, being a zinc-based- (and IMO early-war-period) version being a: 'Buntmetall'- (ie. 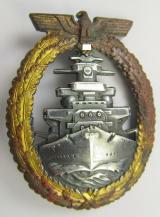 'Tombak'-) based and/or (IMO) early-war-period example that is neatly maker- (ie. 'Fec. 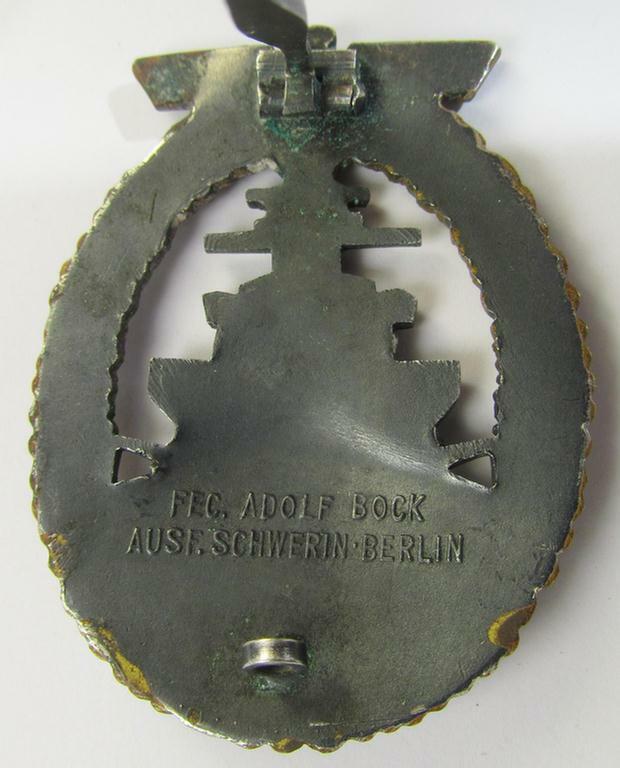 Adolf Bock') marked on its back and that comes in an overall nice- (albeit clearly used- and/or worn-), condition. The very detailed- and/or pronounced badge maintains most of its original, golden- ie. silverish-blue-toned finish and is nicely maker-marked on its back as stated above. 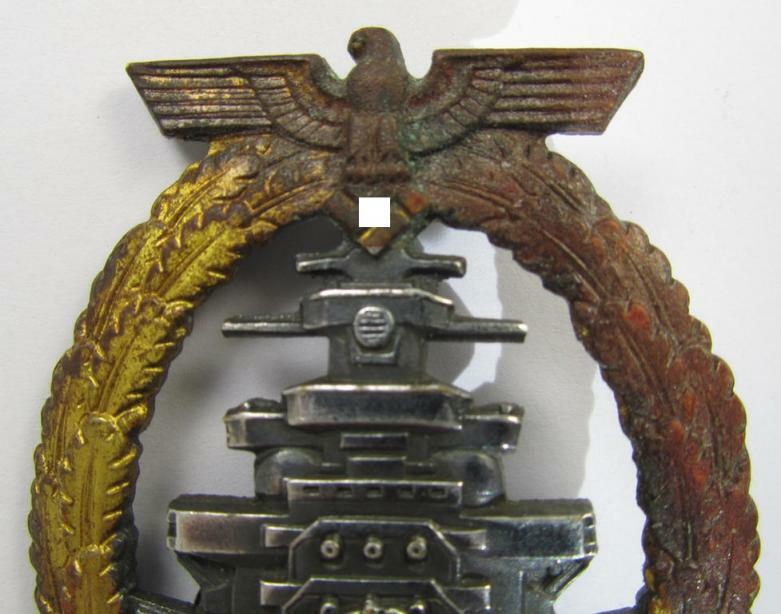 The badge - which also shows the superimposed text: 'Ausf. Schwerin-Berlin' on its back as to be expected - comes of course mounted onto its (fully unaltered!) 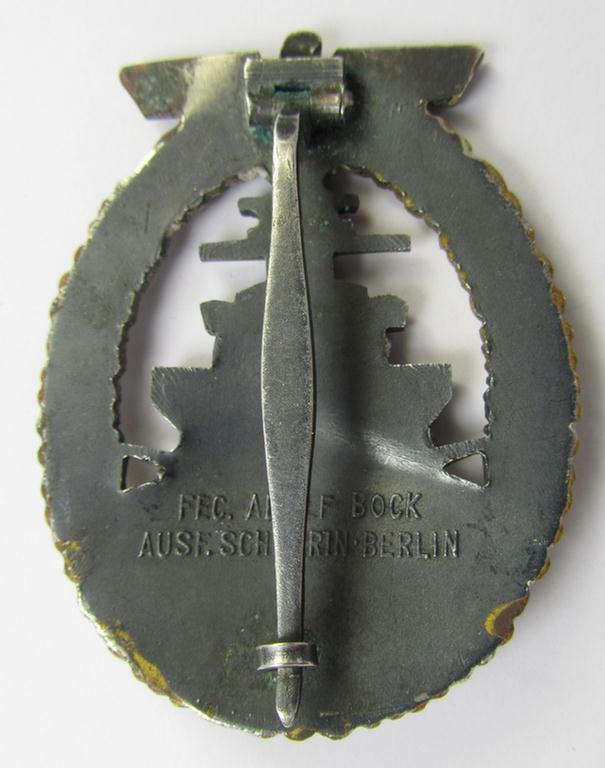 functional (flute-shaped-) pin and/or (typical-) catch (both being typical for these by the 'Adolf Bock'-company produced naval war-badges). 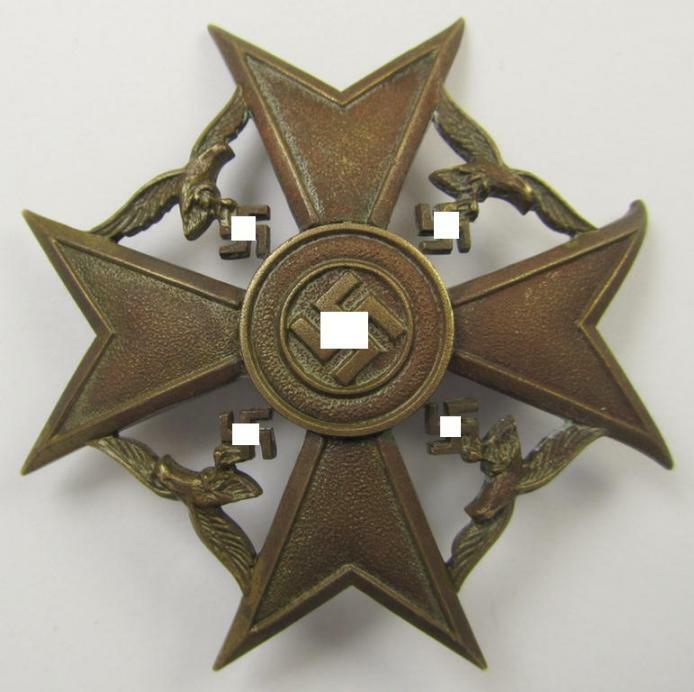 The badge on offer here was with certainty never cleaned nor polished and came from a private household in Germany: it was found together with the Spanish Cross in Bronze that I offer under number: 46806: both awards belonged with certainty to the same soldier. IMO did I price this - actually fairly scarcely encountered and fully untouched! 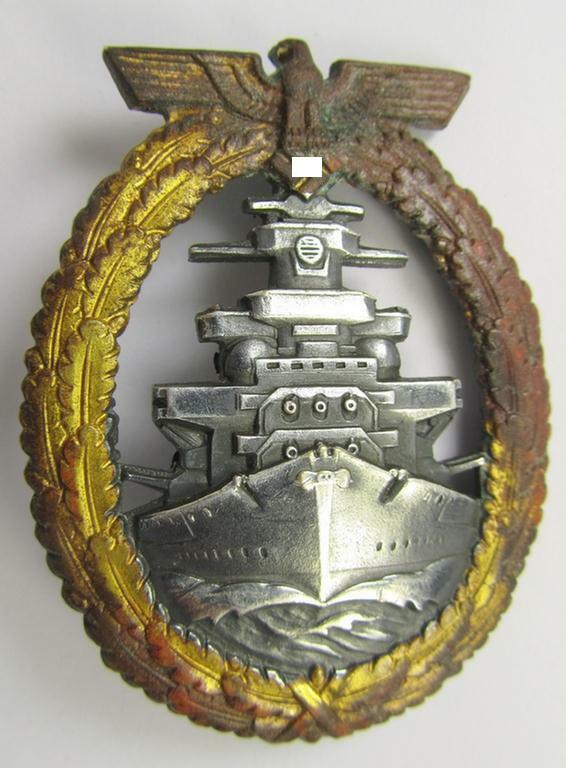 - navy war-badge acordingly! This is a truly attractive - and actually not that easily encountered! 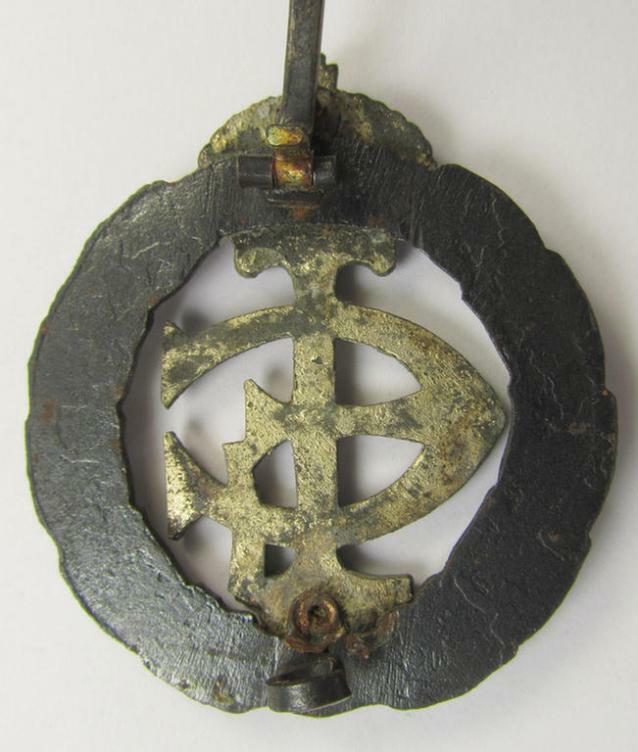 - so-called: 'Spanienkreuz ohne Schwerten in Bronze' (or: Spanish cross in bronze without swords) being a neat non-maker-marked example that was produced by a to date unidentified maker and that comes in an overall very nice and (IMO only moderately used ie. worn-), condition. 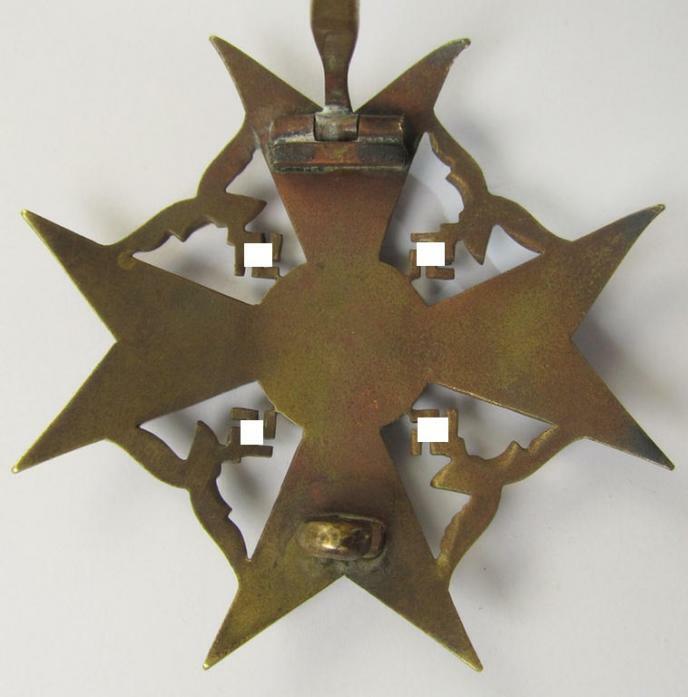 The neat and very detailed award - which comes mounted on its functional (copper-coloured- and typical 'flute-shaped'-) pin and/or catch (-set-up) - and is a highly-detailed, bronze-coloured- and/or pronounced (and IMO 'Buntmetall'-based-) specimen. The award truly retains all of its bronze-toned (ie. somewhat darkened-) bronze-toned finish and was IMO only moderately worn (but was certainly never cleaned nor polished). 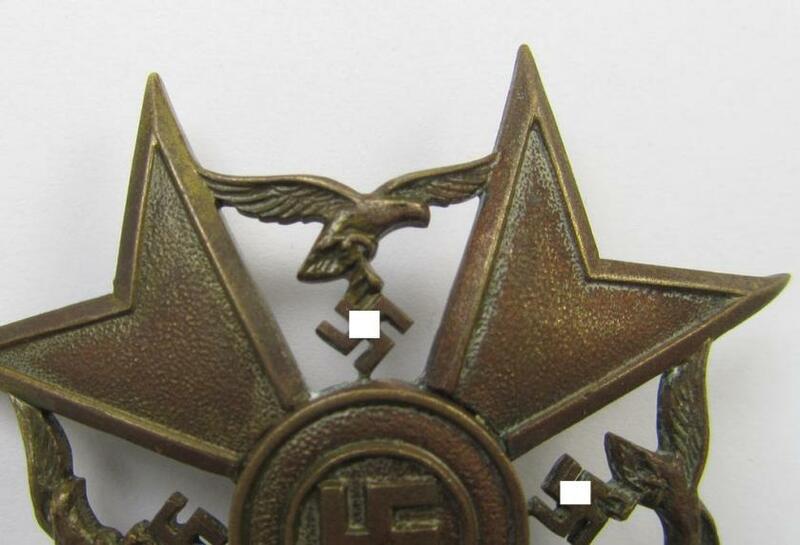 The piece originates from a private household in Germany and was never before in collectors'-hands: : it was found together with the 'Flottenkriegsabzeichen' that I offer under number: 46807: both awards belonged with certainty to the same soldier. Simply a very attractive example of this fairly scarcely encountered and/or very decorative award which is IMO accordingly priced! This is an attractive - and fairly scarcely encountered! - WWI-period-, silver-greyish-coloured breast- ie. 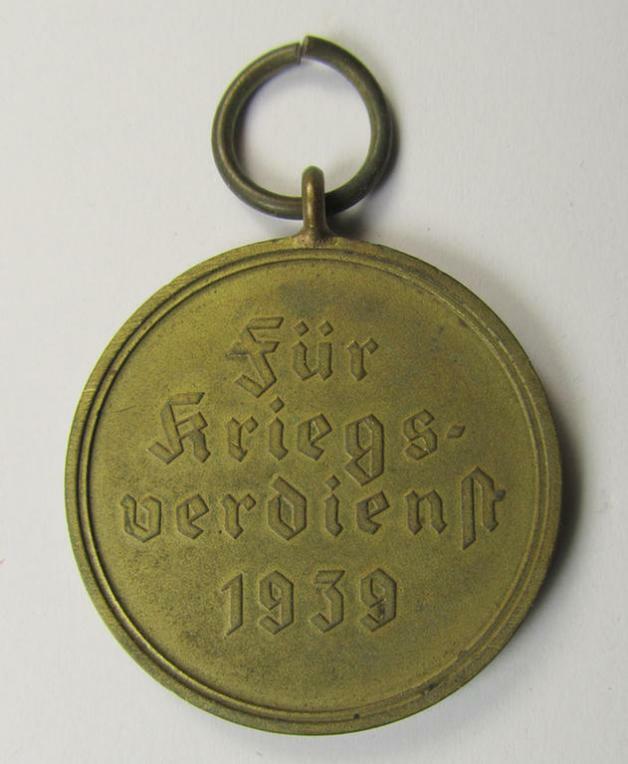 commemoratie or honorary-badge also known as: 'Kriegerehrenzeichen in Eisen 1917 des Grossherzogtum Hessen' being a two-pieced example as executed in zinc-based metal (ie. 'Feinzink') and that comes in an overall nice (and IMO only moderately used- ie. worn-), condition. 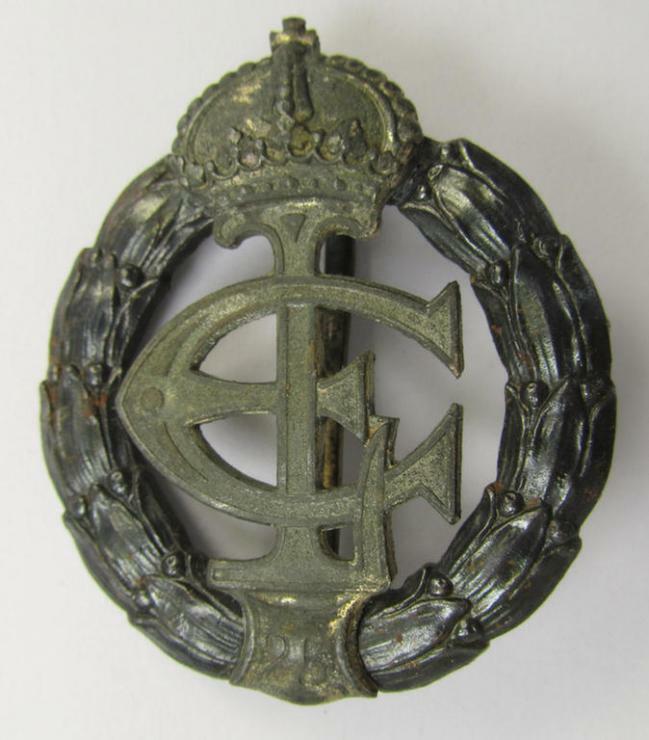 This - non-maker-marked - WWI-period-war-badge showing a crown and capital characters 'E'- and 'L' and numeral: 25 - is made out of silverish-grey-coloured- and/or zinc-based- metal (ie. 'Feinzink') and is just a tiny bit stained ie. dirty but was never cleaned nor polished (as can be seen from the pictures). These attractive and medium-sized badges (measuring approximately 4,7 x 4 cms.) came with an official award-document (ie. 'Besitzzeugnis'): they were instituted on 23 March 1917 in order to commemorate the 25th year of 'Großherzog' Ernst Ludwig being in power. The piece was - as stated above - never been cleaned nor polished and comes of course mounted on its functional pin-/catch (-set-up). Simply an attractive example that is hard to be upgraded and that is IMO accordingly priced! This is a neat - and fully complete! - 3-pieced SA- (ie. 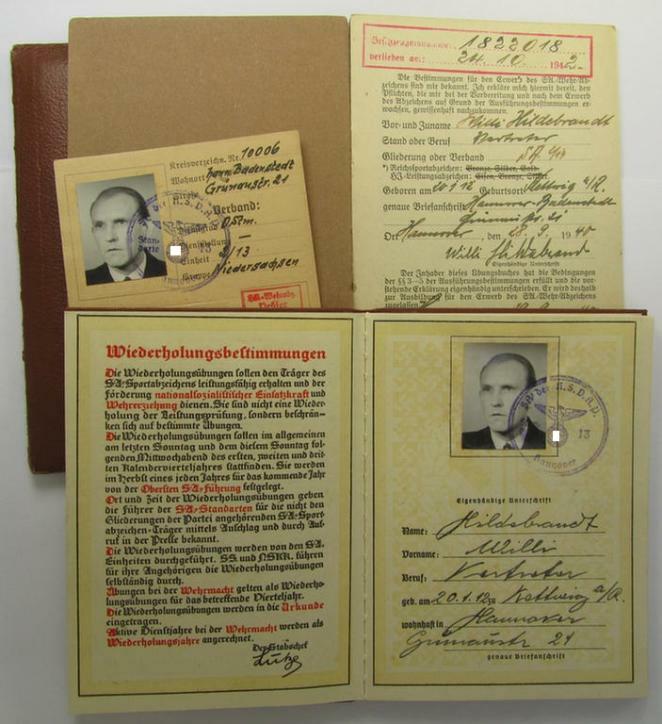 'Sturmabteilungen') award-document-set comprising of a (typical light-brownish-coloured) award-booklet (ie. 'Urkunde') with accompanying etui (ie. 'Schuber'), an exercise-book (ie. 'Ubnungsbuch') and award-card (ie. 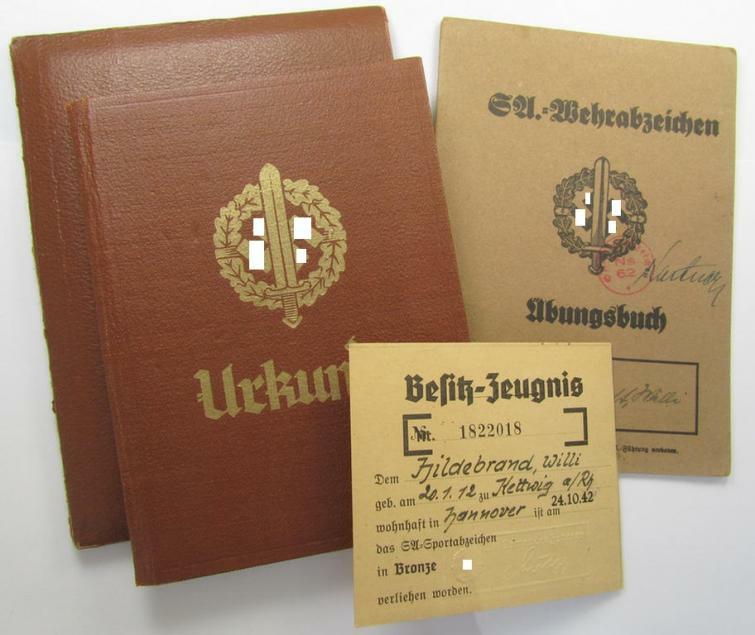 'Besitzzeugnis') as all issued in 1942 for an: 'SA-Sportabzeichen in Bronze' to the: 'SA-Mann' named: Willi Hildebrand born in 1912 and that comes in an overall very nice (ie. 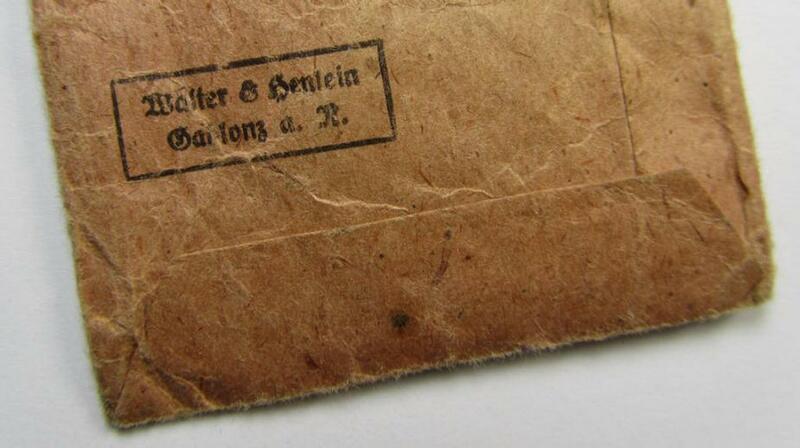 not damaged nor denazified and/or fully filled-in-), condition. The typical, 'standard-issued'-type award-booklet (sized only: 14,5 x 11 cms.) is a beautifully preserved example that was issued on 28 October 1942 and that comes in an overall very nice and/or: fully complete condition having all its 28 pages present and in-place: it has not been 'damaged' whatsoever (and shows a fully preserved illustration of a golden-toned 'SA-Sportabzeichen in Bronze' on its cover) and comes in an overall nice (albeit with certainty issued- ie. used-), condition. This award-booklet (that comes with its accompanying etui ie. 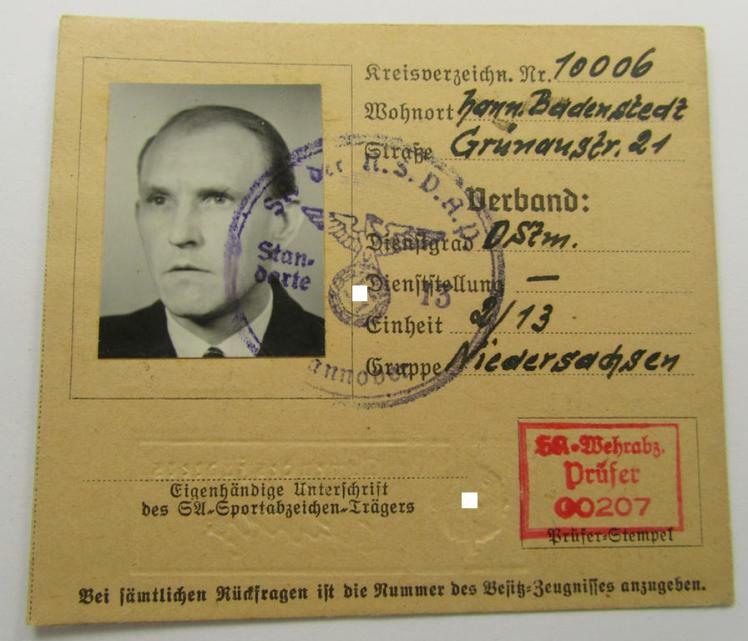 'Schuber') shows a (civil) photo of Hildebrand and shows all the regular entries as to be expected (as can also be seen on the pictures). The exercise-book (ie. 'Ubnungsbuch') is also fully complete and shows all its 6 pages (which are fully filled-in and that show the various ink-stamps as to be expected). The small-sized (and scarcely seen!) award-card (ie. 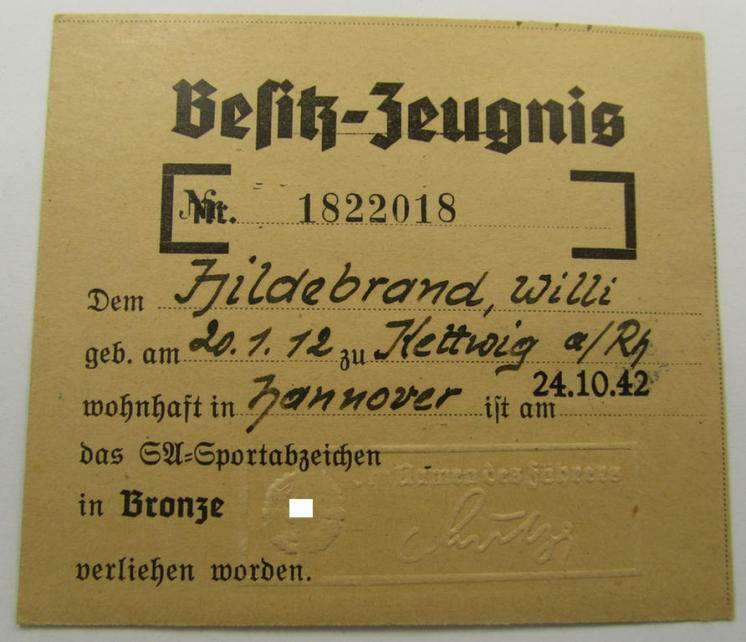 'Besitzzeugnis') shows the same (civil) photo of Hildebrand and certifes that Hildebrand is entitled to wear an: 'SA-Sportabzeichen in Bronze' with the unique serial-number: '1822018' (as can be seen on the pictures). 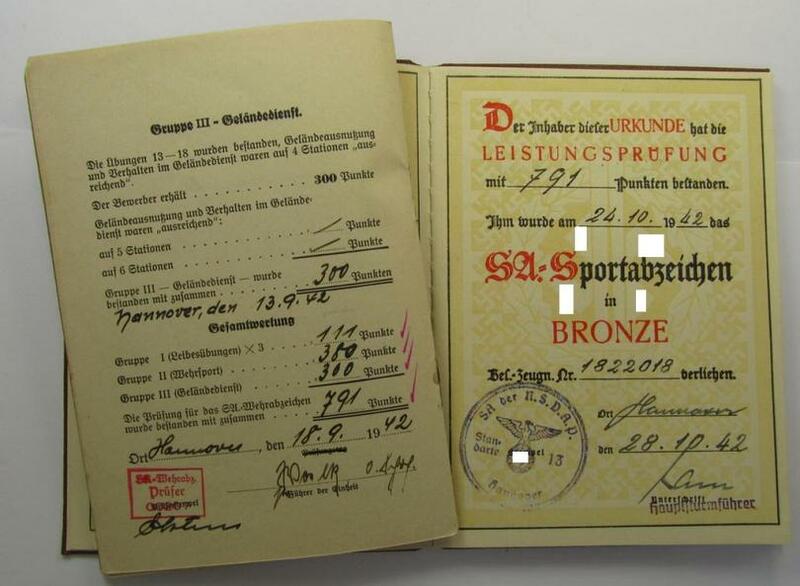 It should be noted that these neat and fully complete document-sets for the 'SA-Sportabzeichen in Bronze' are not that often encountered: I deem that I have priced this neat set accordingly! The extraordinary piece on offer here is a very attractive - and truly detailed! - example, showing a truly blackened- (ie. silvered and/or non-magnetic!) tank-badge mounted on its original piece of 'woven', silver- ie. 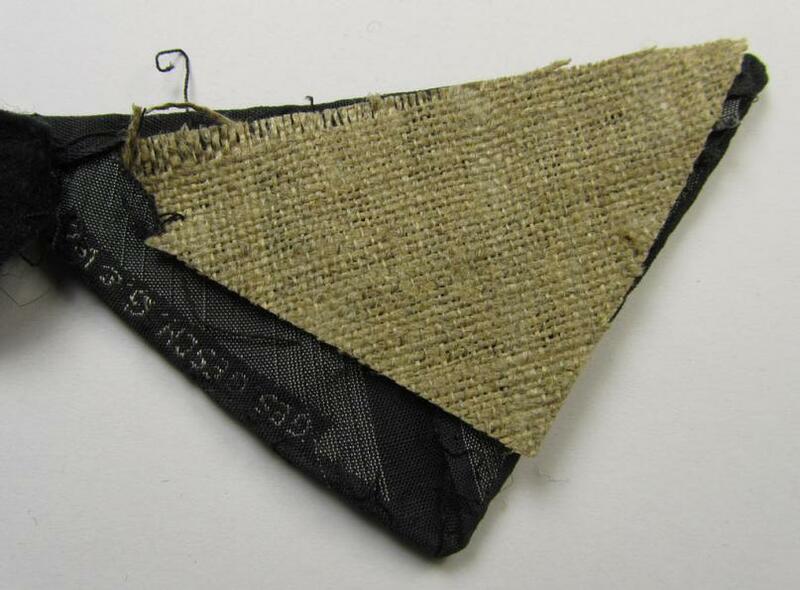 black-woven cloth ie. braid. 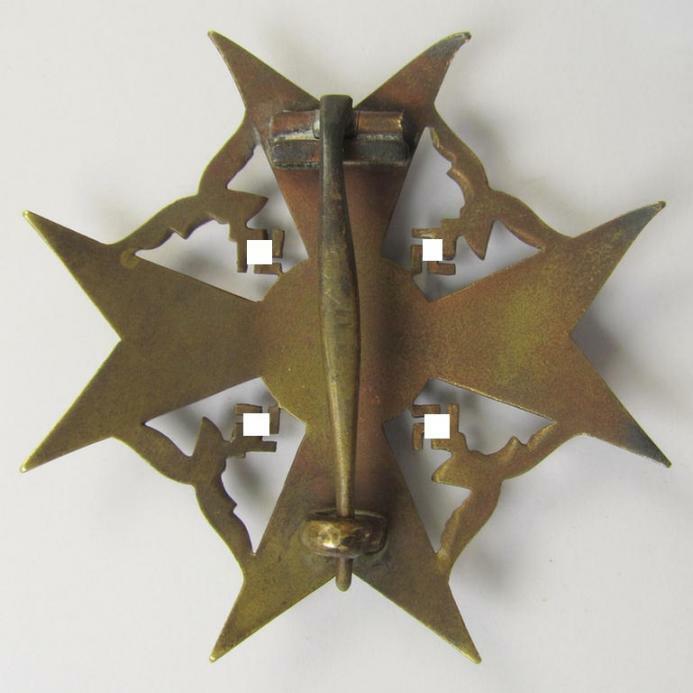 The piece still retains its original (three) prongs and/or metal-based back-plate (which is obscured by a piece of field-grey-coloured- and typical, smooth- ie. 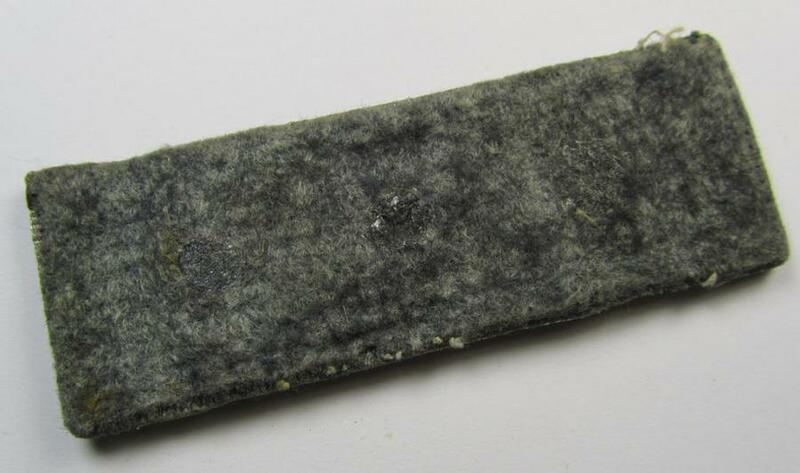 felt-like woolen-based cloth as to be expected). The piece was most certainly once worn and (carefully!) tunic-removed: it still shows some minimal (machine!) stitching-remains (ie. holes) on both its sides caused by having been once tunic-attached. The truly nicely 'blackened'- (ie. 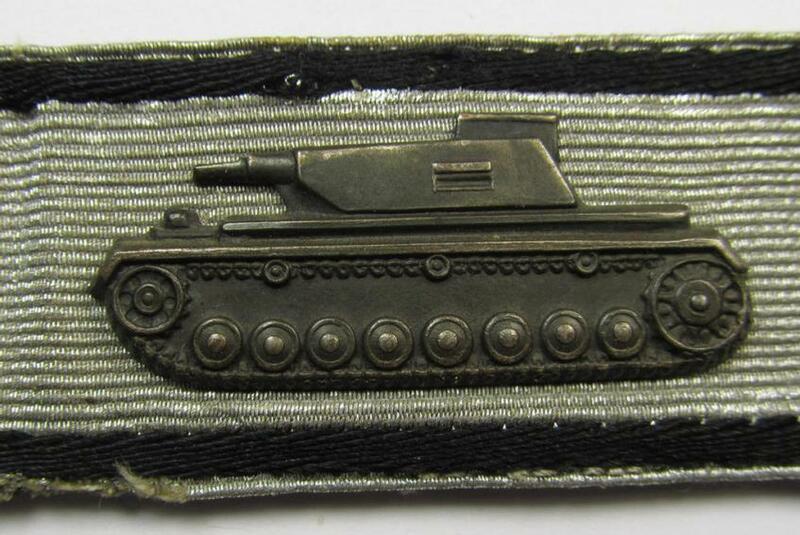 'Buntmetal'-based- and magnetic-) tank-badge shows some minimal staining but was IMO never cleaned nor polished. 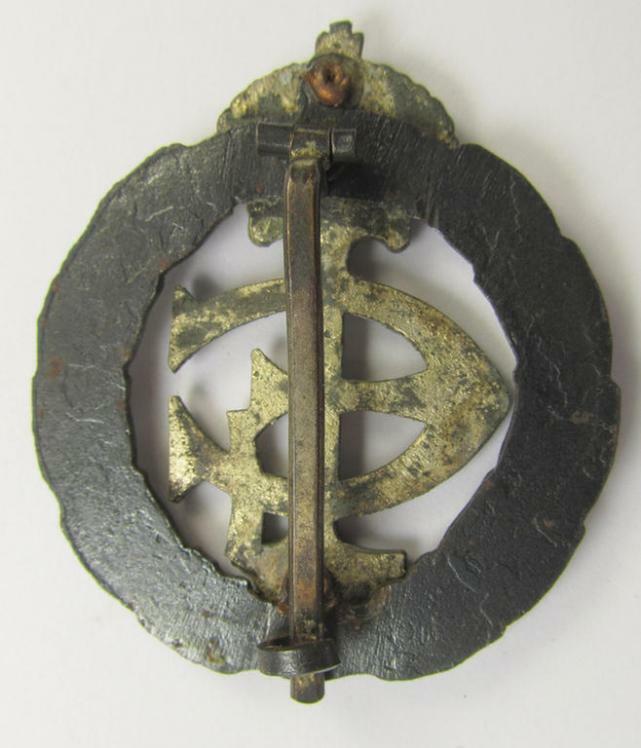 I am of course aware of the fact that this is (probably) one of the most copied awards of the TR-period: this is naturally a 100% genuine and truly worn example for which I do give a life-time garuantee (as always). I deem that I have priced this neat award accordingly to its desirability and/or unmistaken rarity! This is an attractive medal-set: 'Kriegsverdienstmedaille 1939' (or: War Merits'-medal 1939) comprising of a non-maker-marked- and/or 'Buntmetall'-based specimen that comes still packed in its original (and regular-sized- albeit minimally damaged) pouch of issue by the: 'Walter & Henlein'-company as issued and that comes in an overall very nice (ie. IMO issued- albeit never worn- nor mounted- ie. 'virtually mint'-), condition. 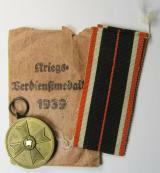 The medal came together with its original, non-confectioned-, bright-orange-coloured (and approx. 22 cms. long-sized-) ribbon (ie. 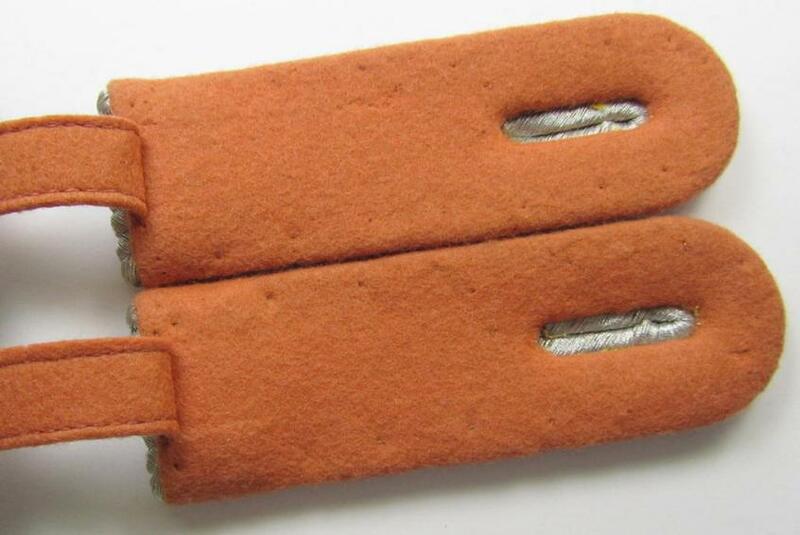 'Bandabschnitt') and came packed in its neat, regular-sized- (and/or: 'Zellstoff'-based-) and/or: reddish-beige-coloured, carton-based pouch (which was roughly torn-open and that misses its 'top-end' as can be seen on the pictures). 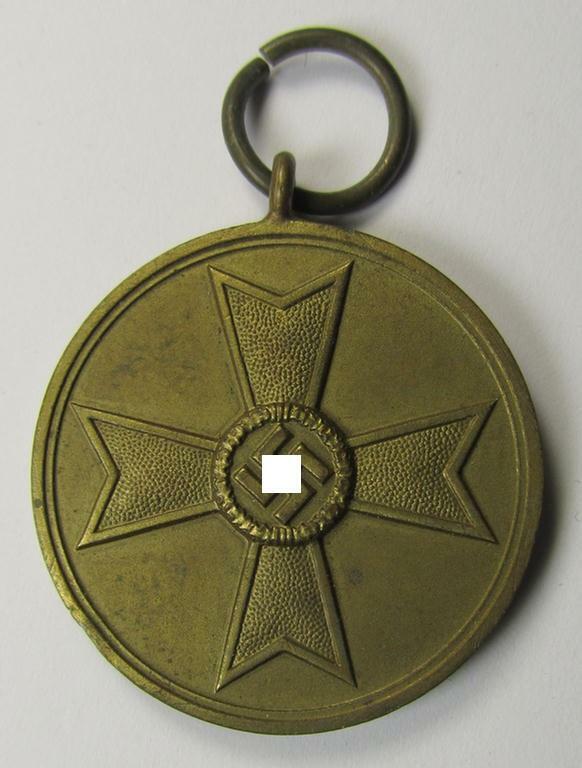 The medal was IMO issued but never used: the award has an attractive golden-bronze-coloured age-patina and was most certainly never cleaned nor polished and therefore are details and/or finish still very nice and/or crisp. 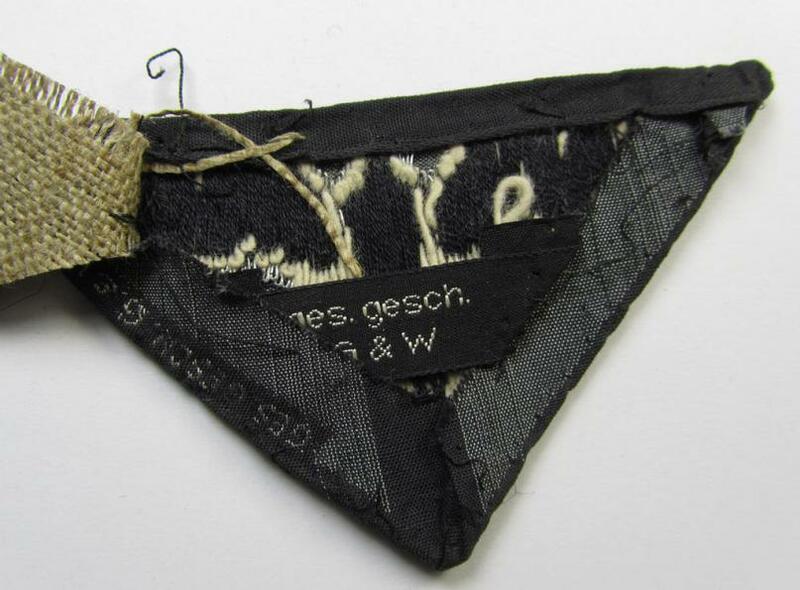 The pouch shows the printed makers'-designation on its back that reads: 'Walter & Henlein - Gablonz' (as can be seen on the pictures). 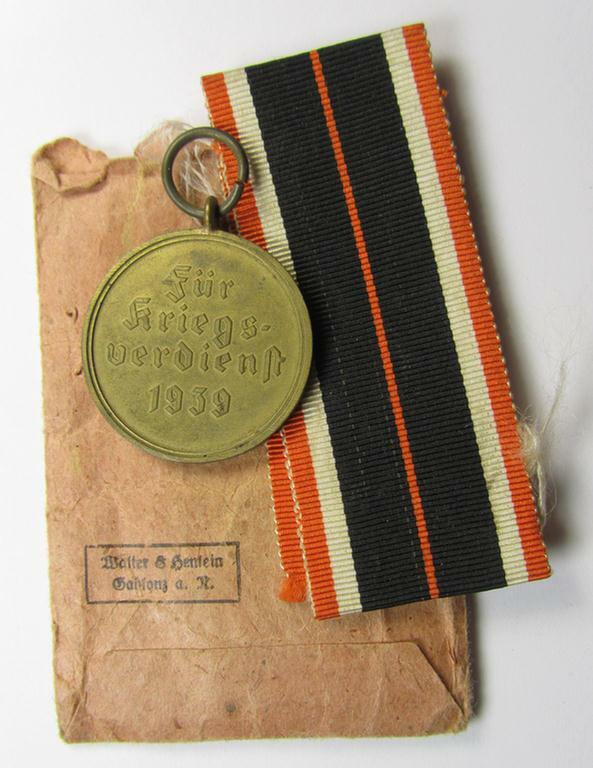 Simply an attractive 'Kriegsverdienstmedaille 1939'-set that was produced by the: 'Walter & Henlein'-company and that will be hard to be upgraded! This is an attractive - and actually not that easily encountered! - so-called: TeNo (ie. 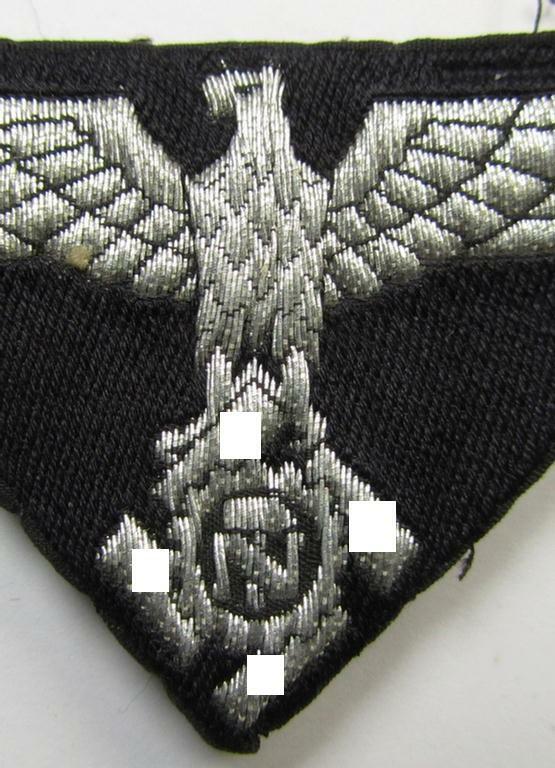 'Technische Nothilfe') enlisted-mens'- (ie. 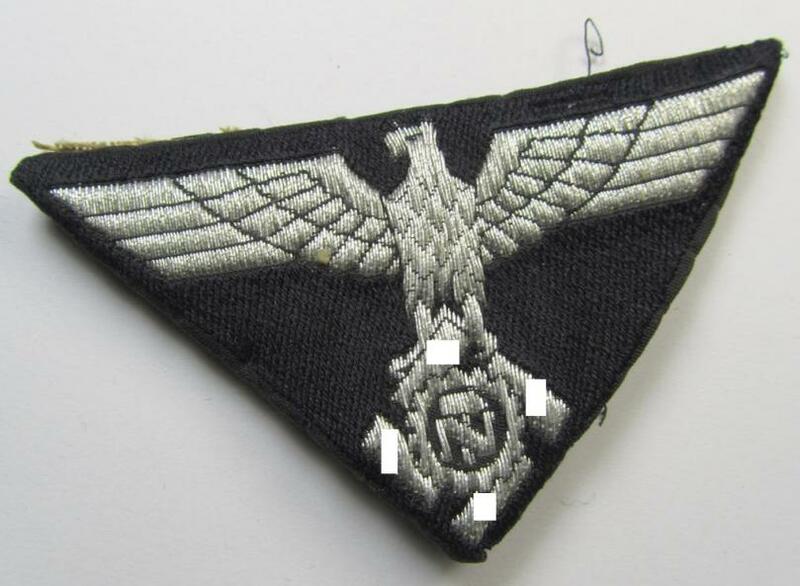 NCO-) pattern, side-cap-eagle (ie. 'Adler für Schiffchen') being an example as was executed in so-called: 'BeVo'-weave, 'flat-wire'-pattern on a darker-blue- (ie. black-) coloured background (it shows an interwoven marking and is additionally showing a seperately attached- and also neatly woven: makers'- (ie. 'G.& W.'-) mark and/or: 'Ges.Gesch.' patent-pending-marking) and that comes in an overall very nice (ie. 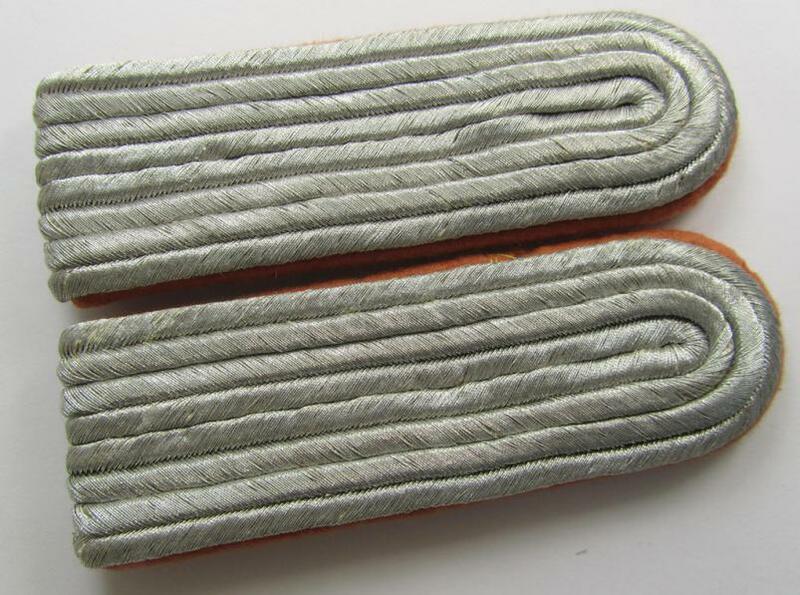 IMO minimally used- and/or once cap-attached-), condition. 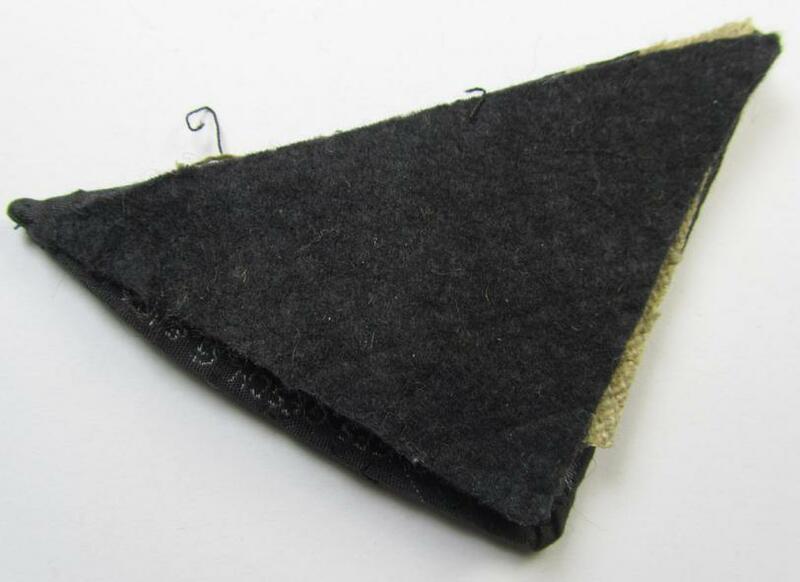 The piece is neatly executed in so-called: 'BeVo'-weave, 'flat-wire'-pattern and carefully confectioned and IMO once cap-attached: it shows a 'buckram'-based backing and is additionally 'backed' with a piece of darker-blue-coloured wool (as can be seen on the pictures). The eagle - which is neatly machine-embroidered in silver-braid on a darker-blue- (ie. black-) coloured and/or linnen-based background - shows extraordinary detail. Simply an attractive piece of miscellaneous TR-cap-insignia that is actually not that often offered for sale! This is an interesting - and with certainty scarcely seen! - oval-shaped- and aluminium-based, WH (Luftwaffe) identity-disc (ie. 'Dienstbrosche' or service-plaque) as was intended for usage by an official who served within the: 'Fliegerhorstkommandantur Elbing' (being a non-marked example that shows a unique serial-number that reads: '74') and that comes in a truly used- (ie. relic- and/or ground-dug-), condition. The piece - which measures approximately 4,8 x 4 cms. - shows a centered LW-eagle-device and engraved serial-number: '74' surrounded by the text: 'Fliegerhorstkommandantur Elbing'. It most certainly once had a pin-catch-construction attached (but this is completely missing as can be seen on the pictures). 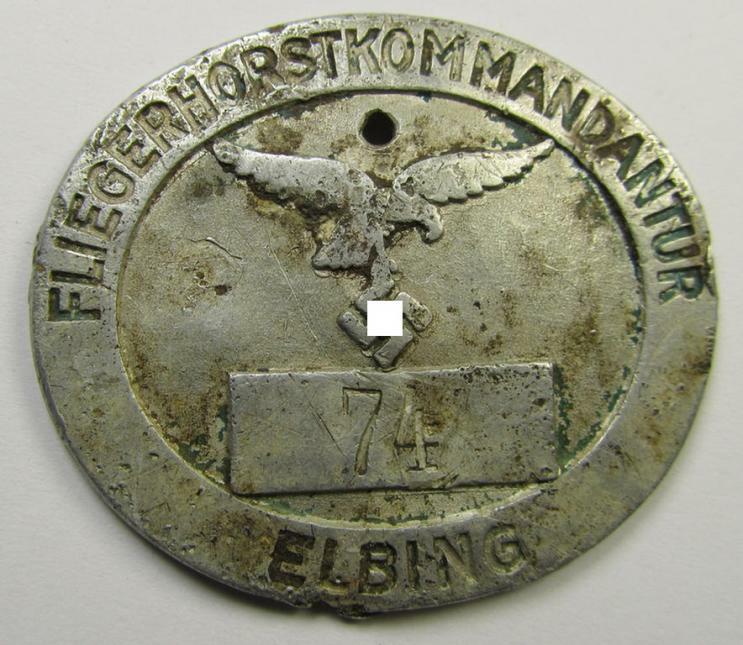 The 'Fliegerhorstkommandantur Elbing' was situated in the Northen part of Poland (approximately 50 kms. south of Danzig near the 'Ostsee' coast) and was an in 1926 founded airfield that was extensively used during the entire WWII. 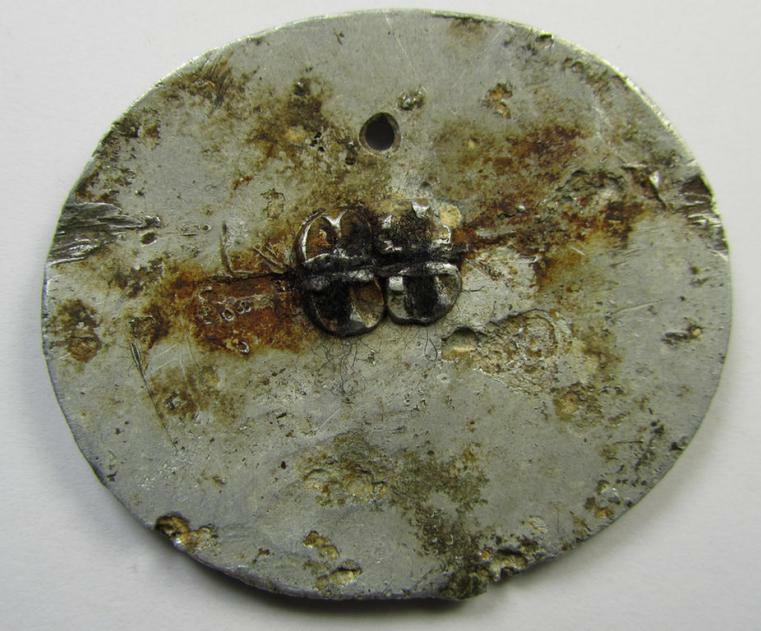 The disc shows extensive usage and wear and is moreover a bit stained and/or dirty (as can be seen on the pictures). I naturally priced this interesting piece according to its obvious ground-dug- ie. relic-condition!